And wrought both good and ill. The passing of the kings. The things he has outgrown. Shall be resumed by men. -- By Anne Virginia Culbertson, in New York Herald. 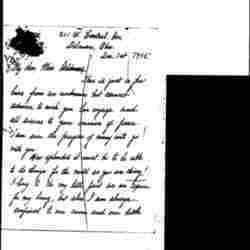 Culbertson's poem argues that the result of the war will be the passing of monarchy in favor of rule by the people. The Passing of the Kings, Baltimore Sun, December 15, 1915, p. 32. 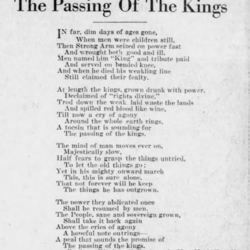 Culbertson, Anne Virginia, “The Passing of the King, November 15, 1915,” Jane Addams Digital Edition, accessed April 23, 2019, https://digital.janeaddams.ramapo.edu/items/show/16668.